The unique mode of left ventricular filling and ejection is by torsion in opposite directions, which is a function of its oblique myofibers. With occurrence of heart failure, irrespective of the underlying etiology, the torsion becomes suboptimal due to distortions in ventricular geometry. 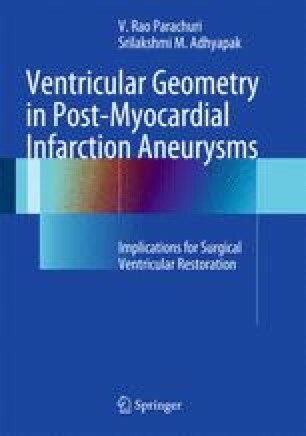 The alterations in ventricular geometry in ischemic cardiomyopathy have been detailed in the previous chapter. Here, we discuss about the various abnormalities of cardiac function in systole and diastole. Optimal function follows optimal form, as is evident by discussions in Chaps. 1 and 2. The perturbations in function which are the hallmark of ischemic cardiomyopathy with left ventricular aneurysms are detailed here.